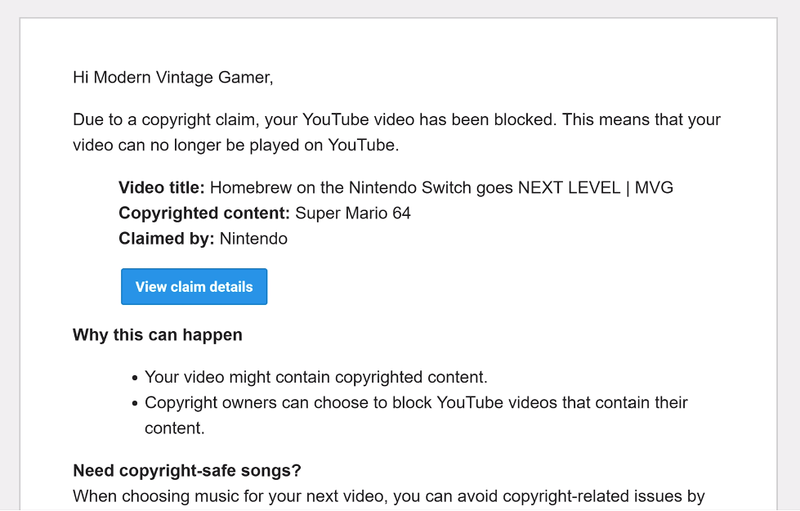 Over the weekend, the YouTuber known as Modern Vintage Gamer announced that Nintendo has flagged several of his videos about emulating old games on the Switch, some with hundreds of thousands of views, for copyright infringement. YouTube automatically takes down videos with strikes against them. He said he tried to dispute the claims, but was unsuccessful and is now taking steps to reupload the videos elsewhere. “They’re all Switch homebrew videos and claims reasons are for things like Mario Kart, Splatoon 2, which by the way I don’t have any Splatoon 2 footage in any of my videos, and Link to the Past,” he said in the video. According to Giannakis, the claims against his videos were because of screenshots or footage of games being played on an emulator that appeared in them. Giannakis argues that his videos fall under fair use and shouldn’t be subject to the copyright strikes, adding that the game’s he’s running on the Switch are all ROMs he owns original copies of and aren’t pirated. In the past the company has been very strict about how footage of its games can be used on YouTube, issuing takedown notices against content creators for things like Let’s Plays and even, in some cases, re-uploaded trailer footage of upcoming games. Last November, however, Nintendo announced a less rigid set of guidelines for content creators. 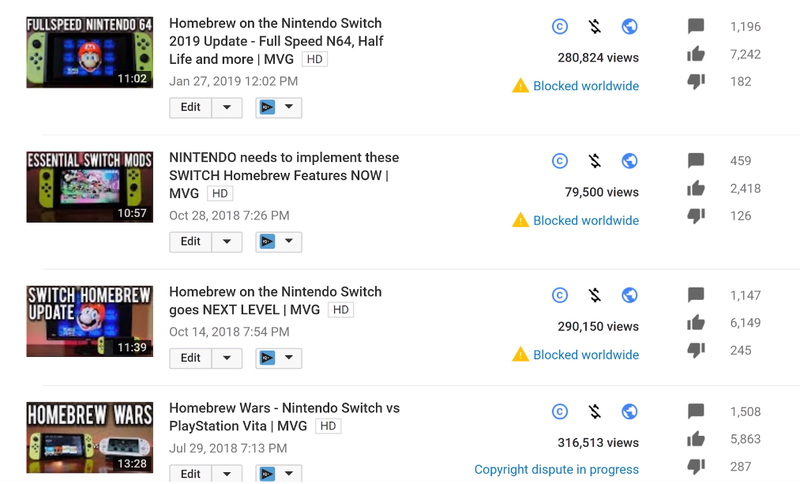 “We encourage you to use Nintendo Game Content in videos and images that feature your creative input and commentary,” the guidelines currently state, though Nintendo reserves the right to take down content it feels violates those guidelines. It’s unclear why Nintendo waited until now to file copyright strikes against some of Giannakis’ content, but he told Kotaku he’s not the only person. On 7 April, YouTuber Tech James uploaded a video explaining that he would no longer be making tutorials about how to install custom firmware on the Switch due to takedown notices from Nintendo. Switch hacker Skullator NZ, who had the same problem last year, eventually moved his work to Twitch to circumvent the issue.